You've worked hard to perfect your rich, decadent cupcake and muffin recipes, so why not showcase your work accordingly in a neat, sanitary fluted baking cup? Simply line your muffin pans with these jumbo muffin baking cups for easy clean-up and a ready-to-go presentation. Each cup measures 2" x 1 1/4" in size. These cupcake liners are perfect for the standard cupcake pans. They are also the same size as the liners available at grocery stores. Highly suggested to purchase for every home even if you only make cupcakes/muffins once every 6 months. At this quantity they will last many years. I also see online that some people use these liners to bake in and then once baked put into colorful liners for decoration. Muffin easily came off of baking cup. Paper fit my muffin tray with a little extra space than standard muffin cups which is great. Very Compact, fits easily in cabinet and does not take a lot of space. Great value for the money. Nice white paper baking cups. Fits perfectly in my standard muffin tins. I have used them to make cupcakes. Hold up well, and easily remove from cupcakes. I'm very happy with these! These work perfect for my standard sized muffins and cupcake pans. They are a good quality, and the quantity for the price just can’t be beat! I love these cupcake liners!!! They turn out perfect every time without peeling from the cupcakes after cooled! The white is perfect for all orders as well!! This baking cups are really good and practical..I used many times for my cupcakes and work perfectly as supposed..the price is not too high..is reasonable.. I tried these liners after using a another product from a local store that quit carrying them and absolutely love these. Very easy to separate as needed and bakes well. These are well boxed and consistent in their bundles, so it makes for easy packaging when needing to repack to resell the product. Flutes are tight and it's a very white white. These are my go to cupcake wrapper. White allows you to see what flavor cake it is through the wrapper. They don't turn yellow when baked like other white wrappers. Love using these fluted baking cups for my large chocolate covered strawberries. They help add appeal to the strawberries and keeps the strawberries from touching each other. These liners are great, I use them for cheesecake cupcakes! They release easily and are great for the price! I will definitely purchase them again! These are really great liners that come off the cupcake really well without tearing the cake. The bottoms do not get greasy at all which is very nice considering I have that problem with other brands. The white fluted baking cup is amazing in quality and quanity for the given price, works great for cupcakes, muffins and cheesecakes. Try them out I recommend. quality baking cup that holds up to the dough and baking. These are pretty enough to use for display also. I am very happy with this purchase. These baking cups are great! they are the perfect size for standard cupcakes. the price on these are great! They are great quality as well. These baking liners are the perfect size for our cupcakes! At first I didn’t think I would like the white liners over the brown, but they work just as well! They also work good for holding strawberries. These muffin cups make baking cupcakes quick and easy. They help keep the cupcake fresh and protect it from drying out so quickly. Also make for easy clean up of muffin pans! These are the perfect standard size baking cup. Perfect cup cakes every time and the liners are easy to separate unlike some others. More color choices wouod be neat. I prefer to using white baking cups for my cupcakes as I feel they look a bit more elegant. These are cost effective enough that I can use one to bake in and add a second one when putting them on display. I think white muffin/cupcake liners are classic, can’t go wrong. Especially when they’re offered in bulk at a good price like this! I make a ton of muffins and some cupcakes, so it’s nice having a large quantity on hand. Much more economical than buying the 50-pc packs at the grocery store. I made some relatively sticky gluten-free cupcakes a few weeks ago that got messy when removing from the pan and decided they’d look neater in new baking cups. Whew, having extra cups on hand saved the cupcakes from turning into cake pops or crumbs! These fit my standard-sized Wilton and Cuisinart cupcake/muffin pans and just barely peek above the top of the pans, which hasn’t affected rise. Will repurchase. These are a must-have for standard sized cupcakes. They are of great quality and the price for 1000 of them is phenomenal! I will not hesitate to order them again! I take orders for sweets almost every week and I got tired of going to the store every Friday to get cupcake liners. I’m so glad I decided to order these! These cupcake liners work great. I use them for your standard size cupcake. They do not stick together, and do not crinkle once they are in the cupcake pan. These fit in the standard size muffin pans. They work well and aren't hard to peel off before eating. We don't use them too often so the 1000 pack lasts us a long time. I like the plain white baking cups better they showcase my cupcakes nicely I like the quality of them they fan out nicely when you open them up. I was concerned that the flared cupcake liners wound affect the crown of my muffins when I received them in the mailed. They did not. The muffins are easy to remove from the liner without ripping it apart. Great product for an even better price. Would definitely purchase again. When I first started out baking cupcakes I thought there was no way I could ever use all 1000 sleeves, but sure enough I did! They are a magical sleeve! They separate so easily and look great with my cupcakes! Plus they peel apart leaving behind small residue. They are so affordable too! What a GREAT find!!! If you’re looking for a great standard liner, these are it. These are ideal for cupcakes, regular size muffins, or even holding stacks of mini cookies. You’ll be surprised how quickly you go through 1000 pack, so take advantage of the bulk discount. Perfect fit for standard cupcakes good quality I buy them all the time and never have a problem with them a good buy for the price. Great price and quality. Perfect size for my standard cupcakes. peel off nicely. I use these now for years and they are my preferred liners at the shop. Good Product. Convenient to buy in bulk when you bake a lot. Comes in bag of 1000. Easy to separate. This is the standard size that fits well a regular muffin tin. We use them for cupcakes, individually portioned meatloaf, individually portioned egg omelette and even to serve sprinkles or candy. Great cupcake liner! These are perfect for standard cupcake liners. They are sturdy and heavy duty. I also use these to help mold sugar flowers. I love them! The shipping process was really fast and I received all the products in good condition! The paper of the cups it's good, the size it's perfect for standard cupcakes! These baking cups are a great value! They are thin and won't stand up on their own, but they work great in muffin tins for muffins and cupcakes. These cupcake liners are a little big for my standard cupcake pans but I'm sure they would be great if my pans were a little larger. These baking cups are perfect when baking your baked goods. Having one thousand cups is perfect for a business so that way you don't run out. These fluted baking cups are great. The quality of them hold up very nicely. We use them in our bakery and so far are very pleased. Great simple white liners that come off clean and bake up really nice. Great price. I will buy these again for sure. These liners fit standard cupcake trays. Great liners at a great price. I love that I can buy them in bulk, and they come individually packed in a sleeve. This keeps them from opening out too much and bending once they’re in the pans. I also have very little peeling with this brand. Good quality for the price, cupcakes came out great. They hold great amounts of filling and still sturdy enough to hold and won't change its shape. We use these as our standard baking cup for all of the cupcakes we produce. They are a crisp white and they hold up well! We love these cupcake liners. They are just the right size for us, so that there's enough lip above the pan to easily remove the cupcakes after baking. Simple and clean wrappers perfect for any cupcake. I own a small catering business and these cupcake wrappers are exactly what I need especially for the price. These were one of the first products we ordered for my daughters cupcake business. The cups are a standard sized cup which was what we needed. No concerns although I do with the cup was a bit thicker more like a craft paper cup, or that we could find them in a few more colors like a craft tan. I fly through cupcake liners in the bakery and these are great. Cost efficient and the bulk size ia so helpful for me. Love them. This cupcake holder - White Fluted Baking Cup 2" x 1 1/4" works great! Love the size and the bright white color. Always use them for either muffins or decorative cupcakes. I purchased these white fluted baking cups to fit into our newly purchased cupcake pan. They fit very nicely and come out with ease, as well as keep the cupcakes intact. A pack of 1000 will last us a long time. These liners did great. They didn't fold at all when adding the batter. They also had little to no grease on liner. Only negative is the package not good for storage. Would purchase again. I can not get over the price of these, such a bargain and so worth it. Used these for candy apples and they worked perferctly! Exactly what you would hope for. Perfect standard white baking cups at a really great price for the amount you get in this order. Would buy again. I just used these today for the first time. They are a great quaility. Good thickness and kept their shape very well. Will definitley keep using these. I enjoy the white classic look of the cupcake liners. They serve their purpose without taking away from the cupcake design. They also peal open easily without messing up the actual cake. These baking cups are a great value. You get a ton of them for the price. I do find that they peel away from the cupcake in humid weather. You can use these for muffins, cupcakes, breads, anything that will fit in it. I have used these liners for many different muffin and cupcake recipes. They always work well and release the product with no problems when you peel away. We loved these. We use them to packaged our chocolate covered strawberries. They are great quality and they arrived right on time for Valentin'es Day! These cupcake liners are great. Good size fits my pan. The neutral colour allows me to use it for different events and the large quantity is very convenient. This is a quality cup cake liner at a very cost effective price point. They work well with all the various muffins we bake each day. I have bought liners from other sites and have had to send them back because they didn't fit my pans just right or because they didn't come apart easily (several glued together or have to wrestle so much they lose their shape). I found Webstaurant, ordered these cupcake liners, and will NEVER order from anywhere else again. They are so perfect for all occasions. These fit standard pans perfectly, slide apart easily, and I've not had to waste one. Very happy with this product! I have been using these for about a year now, and wouldn't use anything else! They come apart easily without the struggle I have when separating the ones in small packs from the local stores. They are also super affordable! Pretty straight forward. These are standard cupcake liners and come in a big sleeve. Exactly what we needed and we continue to order them. Best deal I've found. We use these liners for our jumbo muffins and are very satisfied with them. The size fits our molds perfectly. Will buy again in the future. These baking cups are perfect for our cupcakes. We do cupcake decorating battles, and these are perfect. Well made, and a great price. Highly recommend. These are standard baking cups/liners and make perfect standard size cupcakes or muffins. If you do not need colored or decorated liners, these are the go to liners. They come in a sleeve of 1000, release easily from each other, and release easily from the muffin/cupcake when baked and cooled. Our go to for cupcake liners- we love this brand and we always know the cupcakes will be consistent. You can not beat the price- it is the best you will find anywhere. Great standard baking cups. They don't stick to the muffins or cupcakes like some brands of papers do. Perfect for our establishment. Will definitely order these again because you can't beat the price! Love that I can get these in large packs. These are standard cupcake size and the batter or colors do not run through the paper. I love the price for how many cupcake liners you get. The white is so great and they make for a pretty easy liner to coordinate with any theme. We needed smaller baking cups at our bakery for a large catering order. These were perfect for our needs! They hold their shape well, and the paper peels easily off of a muffin without destroying it. Good price too! My Go to cupcake liners. These cupcake liners are durable, versatile, and very easy to use. The grease don't soak through and the candy stay put! Amazing quality product! The baking cups are sturdy and do not get oily after baking. Holds the batter well, and is not flimsy. Highly recommend! Perfect size for cupcakes, candies and fudge. They're plain enough that the item is the star. Peels off nicely. I will use again and again! These are my go to cupcake liners. They are simple, classic, and suitable for all flavors and colors. A great, versatile item - the only cupcake liners I need. These cupcake liners were a steal!!! They are perfect for my everyday baking needs. I don't have any problems with the liners burning, bleeding, peeling or any other common issues that come with liners. I will definitely be ordering these again!!! Great baking cups! Simple and well made. No need to double layer them. They hold their shape well and don't seem to get very greasy. Such a great value too! They do their job. Nothing spectacular about them and nothing poor about him either. Simple and to the point. I've ordered them a couple times. Perfect! not too big and not small.. just right! fits perfectly in my cupcake pan. And I like them because it is not too greasy and stays in place. I use them a lot with chocolate and vanilla cupcakes and they looked great! Good standard cupcake wrappers. I use these for all of my regular size cupcakes and they work perfectly for me. Great price for the quantity! Sturdy cups..used for cupcakes and muffins, but also for things like nut mixes and dried fruits.. much bigger than they appear in the photo above. These liners are just as sturdy as the more expensive ones. I use these a lot and will definitely order more. They also do not turn brown like some cupcake liners. This item is used EVERY SINGLE DAY in our kitchen for either cupcakes or muffins. Great quality, amazing price (with a HUGE cost savings) and as always immediate shipment. Thank you! These are great! Will definitely order more when needed. We needed a standard size liner and these fit the bill perfectly for our PUPcakes. Our customers are happy with the finished product using these liners. I use to work at a cupcake shop and the baking cups they used were horrible. They were a mess to use and we often wasted a lot because the owner was picky on appearance but refused to shop around for a better quality. I'm very pleased with how they look already. These baking cups arrived at my door in the plastic sleeve and were not damaged or bent at all. There are good quality and not too thin. Ten Thousand units in a case means that you do not need to order to often. Good quality and great price. I have seen places on other sites thet takes these cases and break them down and sell 1,000 cup cake papers for a lot more than this pricing. These baking cups have been a great addition to my baking supplies. They are very affordable and great for cupcakes as well as muffins, etc. These are your standard cupcake wrappers that fit into cupcake molds. We also use these as tart liners for blind baking with beans. They do absorb a lot of oil though. I like these. They're basic thin baking cups. When you bake in them, they can get greasy, so watch out for that. They're not the thick liner kind, but you probably knew that from the price. They turn kind of transparent after baking, which I like but some people might mind. These cupcake liners are perfect!!! They are sturdy, thick and don't stick or leak through. There the perfect size, bright white and you receive alot for a unbeatable price from here. These were a great price and you get a TON. We bake daily and still have plenty. They work just fine for their intended purpose. We bake muffins, cupcakes, brownie bites and more in these. These are true standard cupcake liners. They fit perfectly in standard Wilton cupcake pans. Pleasantly surprised with the thickness, and how well they hold their shape. I love that these baking cups! The white color allows me to use them for a wide variety of design. They serve their purpose well while really letting the cupcakes shine! The don't stick to each other and hold their shape really well. The price is great I use these all the time. These were much better quality than I was expecting for the price! The cupcake liners do not get super 'greasy' when baking and still have a nice white color to them after taking the cupcakes out of the liner. Not one single cupcake stuck to the liners either! These white baking liners work perfectly for standard sized cupcakes. They are nice quality. They fit my pans well and my cupcakes bake nicely in them. We use these for our mini donuts that we sell. They are perfect in every way. They work great, are perfect size, and budget friendly! Thanks webstaurant! I'm consistently happy with the baking cups. They release easily from the cupcakes when it's time to eat! They meet my needs for white, multi-purpose baking liners. I think for the price, these baking cups can't be beat. They work fine for regular muffins and cupcakes. They are not grease proof, but I wouldn't expect that for this price. If you go through a lot of liners, try these. Simple white basic cup cake cups. They fit perfectly in our cupcake pans. They don't stick to pan or cupcake. Great price for 10,000. You'll pay double that in stores. Cupcake liners are great I would recommend them to everyone. It works great and you get alot in a pack for a good price. Love! These liners are absolutely perfect for baking cupcakes! They are good quality and they don't peel off the cupcakes after baking. In addition, my customers love the fact that they are a little larger then regular standard cupcake liners. I definitely recommend these cupcakes liners and will purchase again. These baking cup liners are the perfect size for a standard 12 muffin pan. I bake muffins daily, and these make cleaning up the pans a snap. The baking cups are the perfect size. They are not greasy on the bottom when they come out of the oven. And the price is great for the amount. Will be buying again! Great price for these cupcake liners!! At grocery stores i pay more and on the website i get twice as many for the same price. Does a great job for regular sized cupcakes and rice krispy treats. These cupcake lines are great I use them for everything. The priced is awesome and I love the super fast shipping. I will definitely be ordering again. These are great for the price. You get a lot that last a long time. I would recommend these for any cupcake maker or cake cooker. I am a little disappointed in these baking cups. They are too tall and too wide for my standard size cupcake pans so they always leave a little at the top and have wrinkly sides. I don't love the overall appearance of these and would try to buy smaller next time. Standard size liners for cupcake and muffin trays. Works very well for cupcakes and small or oversized muffins. They keep batter in well unless you're using a very buttery recipe and in some cases it will be greasy on the bottom after baking. Fits great in standard cupcake pans. Can be used for any flavor and type of cupcake. Will show the color of the cake for a great display. You can't be the price or quality of these baking cups. I've ordered them more times than I can count and they never disappoint. They fit my pans perfectly and cupcakes look great in them. These cupcake liners are a great value. They work like they are supposed to. Easy to remove from the cupcakes or muffins. If you make a lot of cupcakes, definitely buy these. These liners were perfect! First, you can't beat the amount you get for the price. For that reason, I was worried the quality might not be great. But they have worked out fabulous! They pull off the cupcakes really well and make the cupcakes have a clean look. I'd definitely purchase again! A great price for these cups. They're exactly the same height as a standard muffin tin (i.e. Wilton). They come out of the package flared more than expected, but as soon as you fit them into the tin and add batter they are the same size/format. Amazing value! These cups are easy to seperate (no more accidental double cups!) They also pull aeay from the cupcake easily- no waste. They are see through but not too thin. This item is pretty versatile. I use them for cupcakes (obviously) but also as liners for other individual desserts such fruit tarts and chocolate covered strawberries. My favorite part of course is the price. You simply cannot beat that. A bakery can not have to many of these lovelie work horses on hand daily. They are perfect for the muffin & cupcake pans that we use. I Love Them. I First I Was Scaree To Change, But Now Im never gounf back to my old liners. There are perfect. Must have ! If I could I would give these 100 stars! They get the job done, they're good quality, and at a very affordable price what more could you ask for! Hard to beat price. These are great, they don't get stuck together when you're putting them in the pan, and don't fall apart after baking. These are a great buy and are a must have for anyone doing any sort of baking. I only wish they didn't come in a long sleeve and that they were separated by 100's for easier storage. Great standard sized baking cups. They're easy to separate, unlike some others that I've used. They're not greaseproof, but with the amount that you get you can easily double up. Cupcakes don't stick to these liners either. Such a great price for a great product. Cups are easy to separate, and don't stick to baked goods for a clean bite. Easier than spraying every pan down. I love these liners. They're just a little bigger than standard size so the cupcakes look fuller and I don't have to worry about batter flowing over the top. These are great value! They are standard cup size and for 10,000 you can 't beat the price. They also fit perfectly in my cupcake inserts purchased here as well. These white fluted baking cups enhance the presentation of our alfajores boxes that we deliver weekly. They are economic and fulfill their purpose . Soon'll buy again. The perfect white cupcake liners for standard cupcake sized pans. They were just what I was looking for. Will have to order a bunch more! I bought these because I wanted a large batch of cupcake liners for my catering business. I was a little shocked when I first opened the pack because it seemed much smaller than my normal wilton liners. But i liked the look and size of the cupcakes once I was done. Great Baking cups! Cant beat the price and quality! These do not have a weird odor like other cups do. They are also great for separating smaller treats when packaging. These are the perfect size. They also do not pull away from the cupcake like others I have tried. Great price, too! Will continue to order. Great baking cup for the price. I use a lot of these and not necessarily for cupcakes. They were easy to separate and didn't come apart from the muffins when I did bake with them. These are great liners! My only complaint is that they are see through after baking. You can always double-line if you want. They're good for me because they get the job done and they're basic liners for an unbeatable price. GREAT quality Baking Cups. They release easily, and are MUCH cheaper than what you can purchase locally. I would love to see Webstaurant Store carry them in Black. Good purchase ! I do bake muffins a lot and run through the store bought liners very quickly. This is very economical. I'm ready to buy more. Love these liners! These liners are great for the day to day baking items. i use them for cupcakes as well as to present other treats. These are a great base liner if you add colorful liners after baking. They are super sturdy, reliable and affordable. I bought these cupcake liners first because of its price - unbeatable. When I made my first cupcakes with them I was surprised on how well they kept their shape and more so when I saw no leakage or bleeding. I have already recommended them to friends! Certainly I will be buying these from now on! This was a very good deal .I love to make cupcakes .I will order these again and they a lot come pretty quick I wish you had more of a selection. These standard size baking cups are a great value! They are more affordable than the grocery store and work great. My cupcakes always bake up nicely in these cups and peel off easily. They fit a standard muffin pan perfectly. Love these liners! Now this size is great for my regular sized muffins. With as many reorders as I get from my bran muffins this is the perfect size for my clients. I bought this thinking they'd last forever. I have ditched all of the other liners I use and only use these. Sturdy and easy to separate. Wow, the quality is incredible. I was prepared for "bleeding" food color and change in appearance when we add some of our brighter or darker colors, but it never happened. These liners held their shape and held their color. I won't be ordering them from anyone else anytime soon, that is a promise. Thanks for coming through for us again, the children were just delighted. These baking cups are excellent! And so many comes in a pack. I make muffins and cupcakes at least once a week and I never run out of cups. Very economical as well! These baking cups are my favorite! They're affordable and the perfect size! I also appreciate how fast they come in the mail! Makes it easy for re-ordering! These baking cups are just what I need to keep my cupcakes simple. I will only need to buy baking cups for special orders/colors. They are perfect for cupcakes or mini cheesecakes. These will last for a really long time. These fluted baking cups come at a great price and meet the needs of our bakery. The whole wheat muffins release well when they've had time to cool! We also use these paper baking cups for distributing/displaying other baked goods such as brownies. Wow! First of all, the price can NOT be beat! Have you priced grocery store liners lately? The quality is good, and its fabulous to have a big old stack to take from! These are such awesome cupcake liners and they look so nice on my cupcakes. They dont show grease or oil. 100% satisfied customer. Great Product. Great price. Excellent product! The cupcake liners are perfectly shaped, are of the perfect heigh needed to get a quality cupcake baked. There is no off smell or bad discoloration of the liners after the cupcakes are baked. I've used branded cupcake liners (cannot name the lady's brand here, if you get the hint ;-)), and they smelled like chemicals after baking, but not this brand. Webstaurantstore carries great products at great prices!! These are my go to liner. They are a great price. They come off the cakes perfectly, unlike some of the more expensive ones. My fave! These standard cupcake liners are amazing. They fit perfectly in the pan that I bought from this website and other pans also. Mostly they are durable. I was tired of always running out of cupcake liners, and these are the best price around. They are wonderful basic liners that peel off without tearing and leaving paper on the cupcakes. Nice that they just come in a long sleeve and not excessive packaging. These cupcake liners work good for both our cupcakes and our muffins. Much better and cheaper than buying local. Great product at a great price. I'll definitely re-order. Excellent Baking Cups! I use this for vanilla cupcakes when I want a clean look to my cupcakes. They hold up well to the batters I've tried with them. Superb price! These baking cups are very economical for the amount of cupcakes that we have to produce daily. They are simple, but serve the purpose well. We have a large family and frequently bake large numbers of muffins at a time. These are a huge time saver for me...no more scrubbing out muffin tins. I love that they are plain white and they don't tear easily when peeling them off a baked muffin. Its a great value compared to buying baking cups in small retail packages. These are perfect, they don't bleed or break. They come off easily, and they bake perfectly. I will be happy to re-order them, but I am not sure when I will need to. Great price. I love these cupcake liners I use them on all my cupcakes. Also it's such a good price for some many. These cupcake liners are really awesome! We use these fluted baking cups to make our standard sized cupcakes. A 2oz scoop of cake batter fits perfectly into these and bakes up the the top. They also don't allow much grease through that would stain our cupcake boxes. Additionally, we use them to hold cut bars and brownies on dessert trays. These baking cups were the perfect size and way cheaper than the local grocery store. The quality is second to none. Thanks for a great product! These fit perfectly into standard cupcake pans. We use these for our "regular" size cupcakes. We like that the color of the cake shows through the paper vividly. Red velvet cupcakes look beautiful in these papers! These are the cup cake holders that you are looking for. I looked and found myself cross eyed trying to figure out which ones i needed. These fit a normal size cup cake pan at home. They also fit websturant cup cake boxes and holders. This was a great deal! They are perfect for standard size cupcakes and they helped me save money so I can give my customers better pricing. Buying these in bulk help! These are the best baking cups I have found so far. They don't loosen up on the cake like some others, but release appropriately when being eaten. This price is also better than my local restaurant supply store. I actually bought these for home use, since I bake a huge amount of cupcakes for both our home and all family get togethers. These liners work very well and are easy to separate from your baked goods. Also, the price is unbeatable! These are awesome. Exactly what we needed. Very economical. Certainly can't get these in the grocery store. I'm very happy with this product and the quick delivery. This is the best deal out there! Perfect size and come in sleeves that fit perfectly onto shelves. Just the right size for standard cupcakes. Perfect sized baking cup for large sized cupcakes. Color does not bleed through and neither does grease. The price is right in line with what we want to spend too. Great buy! Got a ton of cupcake liners at a great price. Since we're a new business, price drives everything. We will be buying all our cupcakes liners from here going forward. These cups have been great. Very sturdy, no breaking, no leaking through nothing. I only gave them 4 stars due to their height. If you want the cupcake to be a little taller get the 2 x 1.5 but other than that excellent product will keep on buying. Oh the years I've bought those packages of pastel baking cups at the grocery store. For the longest time, that was all that was available to the home baker, so if the pastels weren't appropriate for an occasion - too bad. Not to mention over the years the prices have increased dramatically. These white baking cups are so professional looking, sturdy, and work anywhere. Use them all the time. And such a good price! We love these liners. They are perfect for our standard size cupcakes. They're super easy to peal off the cupcake, and the white color is the perfect neutral. absolutely love these liners they never fold in on them selves like dollar store liners they nestle in the cupcake pan perfectly I try to never run out they are great! Very good price for the amount! I use these to make cupcake tarts and candles for my business. Will only order these from you going forward! Great buy! These cupcake wrappers come in sleeves so if you are in a tight place you do not have to have the whole box out. everything as expected. Don't rip easily when handling them. fits a standard size cupcake just fine without any surprises. For the price this is a very good buy! Great product at a great price. I bake a LOT of cupcakes, so I knew I could never get too many classic white standard-sized cupcake/muffin liners. I love that you can buy in bulk and the pricing here is much better than my previous source. These are the best cupcake liners I have purchased and very inexpensive! The liners keep there shape very nicely to show off my one of a kind cupcake creations! These are great - they are sturdy and hold up to any batter I put in them - very happy with my purchase of these liners. This was my first time buying these and they work great for the price. You cannot go wrong for a basic white cupcake liner...will buy again. These are the only papers we use now. Too many other brands pull apart from the cupcake. It took us a lot of experimenting before we found these. These are quality liners that make standard size cupcakes. Although good, important to note that they are not grease resistent and do not maintain a solid white color when using dark colored batters. We use these cups a couple times a year for our season cupcakes and these cups have done a fine job. hey are very good about not sticking to the cupcake and breaking it apart or turning brown on the top. I love using these baking cups because I go through a lot of them, and this price cannot be beaten! They are good quality and come in so many different sizes. I use the mini 1" and these 2" ones a lot. Highly recommended! These worked out great. They were the perfect size and looked great with all of my cupcake designs.. I like the fact that they blend in no matter what color cupcakes you are baking. These are an awesome standard size baking cup. I do approximately 5K cupcakes a year for bakes sales at school. I know my baking cups! These perform like a white Wilton baking cup and take on the color of what you bake as is shown on the picture. At less than 1/10th the price of grocery/craft store prices they are an exceptional value. They are simple and were an amazing price:)I can't wait to use all of these and be able to say I've baked a thousand muffins! Totally LOVE this cupcake liner. It fits perfectly in a regular size cupcake pan and the quality is great. Will definetly purchase an entire case next time I order. The best cupcakes liners I've purchased so far. Great quality and great price! My cupcakes never ever get stuck to the wrapper. I will be ordering these from now on! Really great option to regular cupcake papers. They give a better shape and are cheaper than buying the only type they offer in the supermarket. No more buying little packages of baking cups. I always run out. Perfect size for my apricot brandy mini poundcakes. work just the way they are supposed too! 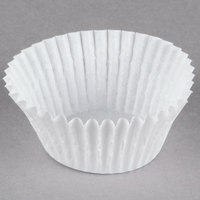 The White Fluted Baking Cup 2x1.25 (1000/pack) are a great bargain, easy to use and look professional. They are easily separated for use and stand up very well. GREAT product! I was looking for a good white cupcake liner to bake the majority of my cupcakes in, and I decided to try these. They are great to use and inexpensive. I loved these cupcake liners so much the first time we had to purchase them again. First we only bought 500 to test them out, they worked out so well and the price was so good that we ordered 10,000 more! These are amazing! EXACTLY what I was needing and they are of great quality before AND after baking! This is the cheapest price you'll find around!